Beautiful weather shined over Southern California making it a perfect day for a round of golf at the Resort at Pelican Hill in Newport Beach for the 7th Annual West Coast Classic. 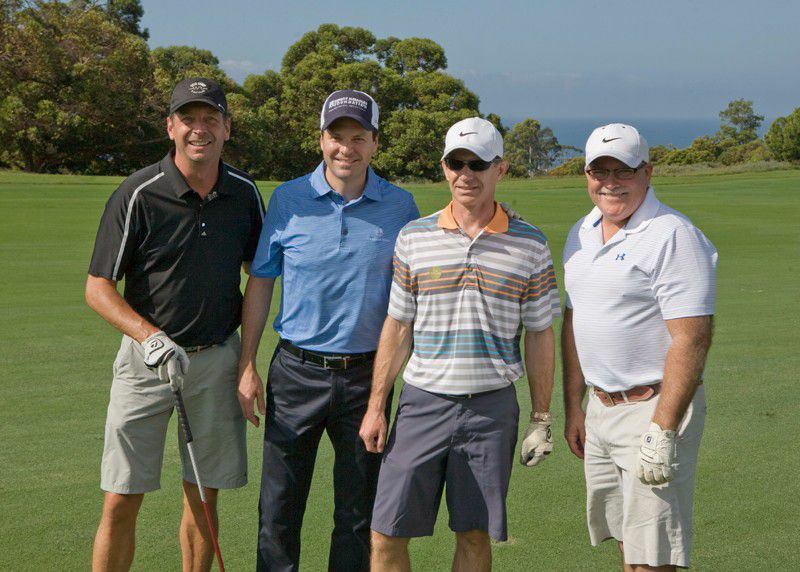 Golfers from nearly 100 West Coast financial companies rallied together to raise funds for the crucial fight against cancer. Breakfast provided by the Bagel Shack and a shopping spree by Tommy Bahama, the tournament’s gifting partner, greeting the golfers. Throughout the day, golfers were treated to Jersey Mike’s lunches, Gosling’s Dark ‘n Stormies, and chances to win some great prizes. When the 18 holes concluded, the golfers gathered for a Sunset Cocktail Party on the patio where they networked and enjoyed delicious food and drinks. Frank Strauss, Founder and Chairman, thanked the Foundation’s loyal sponsors and proudly announced that Expect Miracles Foundation was once again the top fundraiser out of over 160 Jimmy Fund Golf events nationwide. Frank Heavey, Executive Director, shared some exciting news about the Foundation’s impact on the West Coast. “Over the years, we have funded several cancer patient care organizations across California. This year, we have decided to develop a partnership with a cancer facility that focuses on both cancer research and cancer patient care, which is at the heart of Expect Miracles Foundation’s mission. We are pleased to announce we will be supporting The Simms/Mann – UCLA Center for Integrative Oncology, with the intention of creating a longstanding partnership with UCLA’s Jonsson Comprehensive Cancer Center.” With support from this year’s golf event, Expect Miracles Foundation will fund 50 consultations of the estimated 250 annually needed at the Simms/Mann Parents with Cancer Outreach Program that offers supportive care to parents with cancer who have minor children. The Foundation also presented a special gift to former PIMCO employee, Michelle Fischer, for her incredible efforts, along with her husband David Fischer from PIMCO, in raising nearly $20,000 for Expect Miracles Foundation. The top 3 placed teams were able to select the prizes of their choice from Tommy Bahama. In first place on the Ocean South Course were Anna Jamroz (Northern Trust), Chris Dvorak (Northern Trust), Steve Foulke (RimRock Capital), and John Plaga (Canyon Partners). For the Ocean North low gross went to Mark Avery, Tim Barry, both from Jimmy Fund Golf, and their guests Peter Curran and Andrew Cook.The top net went to Chris Lacey’s (BNY Mellon) foursome. The excitement continued as the players participated in the Putting Contest Finals, where Kevin Melancon (BNY Mellon) took first place and won 70,000 AAdvantage Miles. In addition, the Poker Game finished with Will Coleman (Legg Mason) holding a Full House and taking home diamond drop earrings compliments of Carol Klein Fine Jewelry. Thanks to the generosity of Aruba Tourism, Jason Schafer (EY) was the winner of the Opportunity Drawing and is headed to beautiful Aruba! This year’s Live Auction featured items from a getaway to Alberta Canada, to elegant jewelry, to a trip to Cabo San Lucas, Mexico.Expect Miracles Foundation was overwhelmed by everyone’s generosity as the Live Auction raised over $33,000 to help support the fight against cancer. Expect Miracles Foundation is extremely grateful for the support of the golfers, sponsors, and hardworking volunteers who helped put on another remarkable West Coast Classic.